Speakers: Staff from the Department of Foreign Affairs and Trade, Cardno, and The Australian National University. 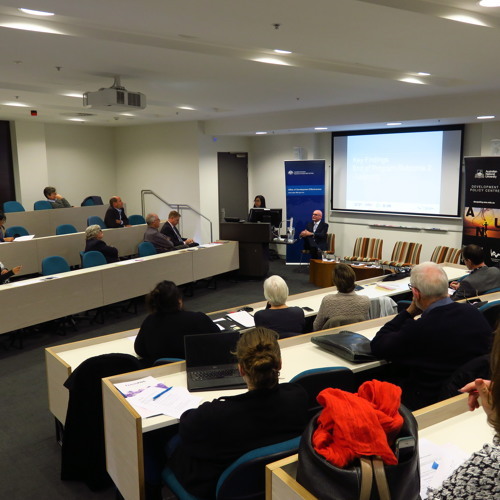 This forum, which was jointly organised by the Development Policy Centre and the Office of Development Effectiveness (ODE) and held on 11 August 2017, was the latest in a series on the evaluation of Australian aid. It focused on two recent evaluations. The first part, discussed in this podcast, was an end of program review for the Basic Education Assistance for Muslim Mindanao (BEAM-ARMM) program, which involved four implementing partners working across four distinct components in the conflict-affected Autonomous Region of Muslim Mindanao. It’s objective was to contribute to poverty alleviation and sustainable peace, through increasing access and quality of basic education, and training for Out of School Youth. The review highlighted some of the challenges and lessons for evaluating and achieving improved educational outcomes in complex, high-risk environments.